Drakes Raid from Historic Florida Militia on Vimeo. Above: What living historians feel like when we participate in a battle in St. Augustine. 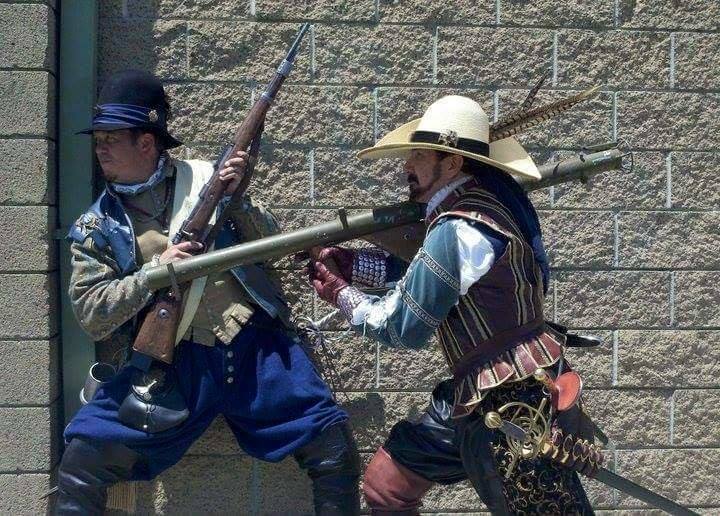 Below: What living historians look like when we participate in a battle in St. Augustine. On June 6th, 1586 twenty-three ships approached the harbor of the Spanish colonial city of St. Augustine with 2000 Englishmen under the command of Sir Francis Drake. 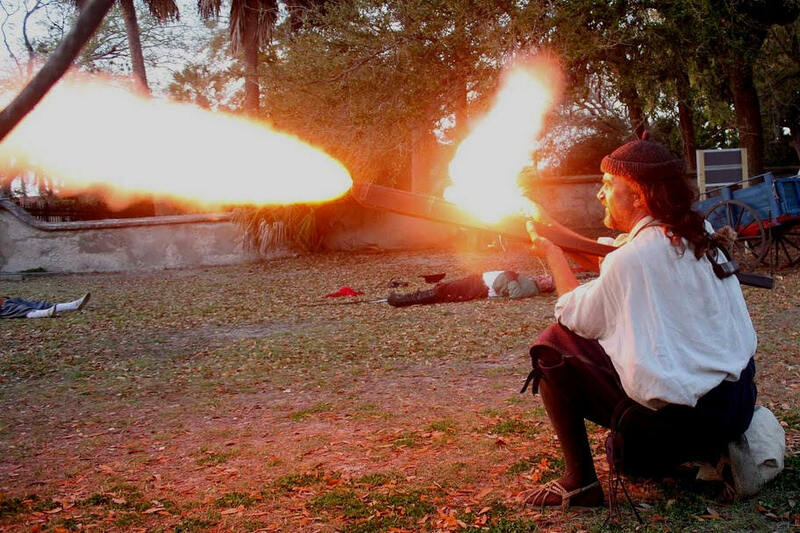 A day after making sight of the harbor, 1000 of these men, led by Captain Christopher Carlile, would land on Anastasia Island to mount cannons opposite the Spanish wooden fort – located on what is now the Fountain of Youth Park – and begin to duel with the Spanish forces there. 300 Spanish would abandon the fort during the night and with daylight approaching on the morning on the 8th the English crossed Matanzas Bay, taking the fortification and proceeding to drive the Spanish rear guard from the city of St. Augustine. 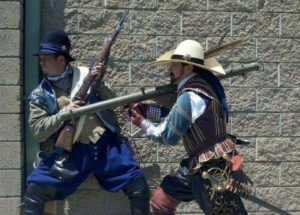 Join us on June 2nd, 2018 in the 30th reenactment of Sir Francis Drake’s Raid on old San Agustín.. During the day (June 2nd) a 16th century-style military encampment will take place at the Fountain of Youth Park and will play host to drills, demonstrations and living history interpretation from 10:00 AM to 5:00 PM. Admission to the encampment is free with your paid admission to the Fountain of Youth. The reenactment of the sacking and burning of the town will commence Saturday evening at 7:00 PM in the old city, beginning at the Old City Gates and ending in the Plaza. This military display is intended to symbolically commemorate the temporary abandonment of the city of St. Augustine by Spanish colonial forces. After the town was looted and burned by Drake’s men, the Spanish returned to rebuild upon the same streets you walk on today! Never been in a living history event before? We can fix that! We usually have a small selection of loaner clothes on hand, you will however need to bring a pair of period correct shoes or purchase a pair of ‘Ropa’ sandals from St. Augustine Textiles. Drake’s Raid is hosted by Companies of the Historic Florida Militia: The Men of Menendez & Drake’s Men. Drake’s Raid is made possible in part by a grant from the St. Johns County Tourism and Development Council.